Possibly pizza along with conversation at 7:00PM in the ISC. We have been selected to host a Yosemite Starparty at Glacier Point on July 19 & 20 2019. This is a unique opportunity for SMCAS and will take a lot of coordination prior to the actual event. The SMCAS Board has started the planning process and will communicate more details shortly. The National Park Service requires that SMCAS host a star party the nights of July 19 and 20. Prior to dusk, we will have to deliver a presentation to the public. The Park Service also encourages (not required) that we host solar viewing on Saturday. In return, SMCAS will receive one reserved group campsite (holds 30) and 30 park entrance passes. More SMCAS members/friends can attend, however they will need to make their own campsite. Star Parties at Crestview Park. 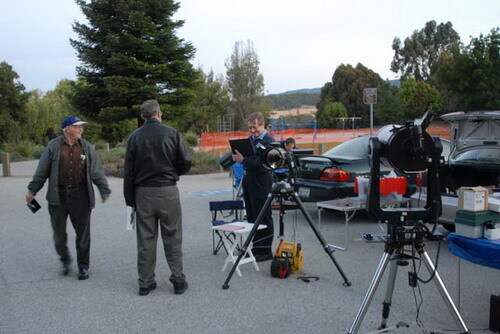 The City of San Carlos Department of Parks and Recreation and the San Mateo County Astronomical Society have open Star Parties twice a month. These events are held in Crestview Park, San Carlos California. Note that inclement weather (clouds, excessive wind and showers) will cause the event to be canceled without notice. If you have kids interested in space or planets bring them here for a real life view of planets, nebula, star clusters and galaxies. If you are thinking of buying a telescope or want help using a telescope you own, come here to talk with experienced users. If you think you might have an interest in astronomy come and talk to experienced amateur astronomers. Astronomers arrive to set up at around sunset. Observing starts at about one hour after sunset and continues for two to three hours. REACH FOR THE STARS AT CSM! Dr. Kevin Peter Hand is a planetary scientist at JPL in Pasadena, California and the Director of its Ocean Worlds Lab. His research focuses on the origin, evolution, and distribution of life in the solar system with an emphasis on Europa. He carries out both theoretical and laboratory research on the physics and chemistry of icy moons. From 2011 to 2016, Hand served as Deputy Chief Scientist for Solar System Exploration at JPL and was a member of the National Academies Committee on Astrobiology and Planetary Sciences. His work has brought him to the Dry Valleys of Antarctica, the sea ice near the North Pole, the depths of the Earth’s oceans, and to the glaciers of Kilimanjaro. Dr. Hand was a scientist onboard James Cameron’s 2012 dive to the bottom of the Mariana Trench, and he was part of a 2003 IMAX expedition to hydrothermal vents in the Atlantic and Pacific oceans. Plan to arrive after noon and before 3 PM for best access to Public Areas. Mount Hamilton Road, Route 130, Alum Rock off of 101 or 680. Please don't pass bicyclists on the blind curves. The Gift Shop is your best contact for current visitors progam status. The APF Telescope is now doing science. enter the building unless you have a good reason to be inside. with special attention to Lick Observatory's role. holdings through cataloging, online databases, and exhibits. (it's actually $1.5M -- we got the third year upon showing good progress). We hope that this is just the beginning of a long relationship between Lick and Google, and several UC astronomers are already doing various activities with Google. Music of the Spheres, 2001 program. concerning the reduction of extra-solar radial velocity data. Reference http://oklo.org/ April 8, 2014. The SMCAS patches are on sale. Actual diameter is 9 centimeters or about 3 1/2 inches.